Part of "The State of Hope Tour." From Marietta to Macon, Sautee to Savannah, The State of Hope Tour aims to encourage and inspire all Georgians to help build the world in which we hope to live. The tour concludes at the annual School of the Americas Watch vigil, which brings tens of thousands to Columbus. Your front page story on local school children sending cards and letters to our soldiers in Iraq was moving. The coverage of this event on Channel 13 showed Col. Berry quoting one child's letter as saying, "I am so glad you are over there defending our freedoms." 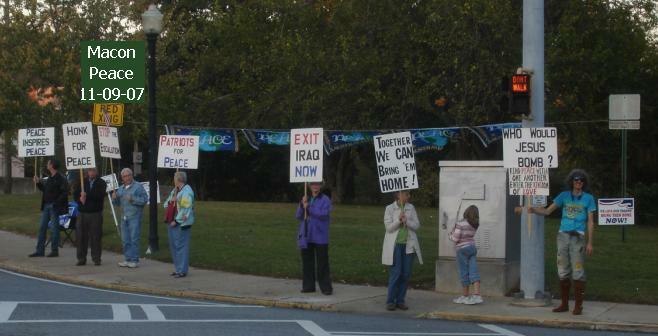 Pardon me, but which of our freedoms are our soldiers in Iraq defending? Iraq never attacked us and never threatened to attack us. None of the 9/11 terrorists were Iraqis, and there is no evidence the Iraqi government was involved in the plot. None. Our freedoms are certainly at risk, but not from Iraq. It is the Bush administration that is whittling away our Bill of Rights. Muslim extremists hate us all over the world. But there was no Muslim extremist threat in Iraq before we invaded them. Saddam Hussein, however evil, was thoroughly secular and no friend to al-Qaida. I am not criticizing our troops. They are just following orders. I am not criticizing the child for assuming that we are the good guys and when we fight it is because our freedoms are threatened. I held the same beliefs at her age, along with a passionate conviction that Americans would never stoop to torturing our enemies. However good it feels to cling to those convictions, responsible adults who through their votes set public policy must face the facts. Lee Ballard's Perspectives' page article on Sept. 29 contains a few points I take issue with. He said, "Congress, via several public laws and resolutions, began the military push into Iraq for the second time long before Bush took office; their last action resulted in Public Law 105-338, the Iraq Liberation act of 1998." Public Law 105-338 says nothing about attacking Iraq. On the contrary, it specifically forbids military action against Iraq. It consist of eight sections, the first seven (too long to list here) outlines what is to be done under the law. The last section says this: Sec. 8. "Rule of construction. Nothing in this Act shall be construed to authorize or otherwise speak to the use of United States Armed Forces. Public Law 107-243, the authorization for use of military forces Against Iraq, passed in 2002, "authorizes the president to use the military as he determines to be necessary and appropriate to implement Public Law 105-338." Public Law 107-243 doesn't have anything even remotely to do with PL 105-338, which was implemented by Bill Clinton in 1998. The words Ballard attributed to David Kay, weapons inspector, and Sen. Ted Kennedy, were taken out of context. If he had kept reading he would have come to these words by David Kay: "My summary view, based on what I've seen, is we're very unlikely to find large stockpiles of weapons. I don't think they exist." So yes, it (is) Bush's war.